As many people have been asking us, “when will we be getting a new vicar?”, we thought that we must let you know what is happening behind the scenes. Bishop Martin has asked for a Parish Review to take place. This will be conducted by Archdeacon Fiona and will happen in February and March 2019. 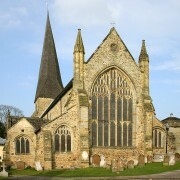 The Parish review is expected to look at the current set up of the Team Parish of Horsham which is currently made up of four churches: St. Leonard’s, Holy Trinity, St. John’s and St. Mary’s. Any suggested changes from the review would then be considered by our parish Parochial Church Council before recommending a way forward. Currently our four churches work together and support each other in many different ways and we are blessed by our close working partnership. As far as we are aware there is no desire from any of the Churches in the team to break away. We have been told that a Parish Review is standard practice in the Diocese when a vacancy like ours arises. As to our new vicar, well no appointment process can really be started until the Parish review is concluded. For the time being we are pleased to welcome Bernard Sinton who the Bishop has appointed as Interim Rector. We will continue to let you know what is happening as and when we know. During the current interregnum at St Mary’s, Bishop Martin has asked Revd Bernard Sinton to act as Interim Rector during the vacancy. Bernard has worked in the Parish since 1990 and was our first SSM (Self Supporting Minister). He is based at Holy Trinity Church. Since retiring from a full time secular job, he has acted as Interim Minister during vacancies in Warnham, West Grinstead and Partridge Green and has just finished at Sullington and Thakeham with Warminghurst. Bernard’s wife is the vicar of Shipley. Bernard can be contacted via the St Mary’s church office or via our contact form: Contact Us. http://www.stmaryshorsham.org.uk/wp-content/uploads/2014/06/St.-Marys-Church-East-IMG_0001.jpg 1868 2824 Alison Carre http://www.stmaryshorsham.org.uk/wp-content/uploads/2013/04/stmaryslogo_new-300x137.jpg Alison Carre2018-12-14 11:46:472018-12-30 18:59:42When are we getting a new Vicar?